The title is an attitude - our tendency to feel defeated by the scale and nature of certain problems. Rather than meet them head on, we circumvent them with a sigh and a consoling “never mind, yaar”. When long time friends Binaifer Desai and Louella D’Costa meet Shalini Dayal at Gyan Shakti College, a true friendship that transcends cultural and religious backgrounds is born. Louella is a Christian, Binaifer, a Parsi and Shalini, a Hindu. The novel’s main plot line surrounds Shalini who has fallen for an impetuous student activist, Bhagu. Where does his desire to help the less fortunate lead him? The challenges are many - Shalini’s tradition bound family, the couple’s youth and inexperience and the travails of life in Mumbai, a city the girls love but know, is fraught with communal tension. When I saw this book up for review on blogadda.com, I thought it was going to be a light and interesting read. But, I was sorely disappointed. To begin with, I had great difficulty getting into the story. The story starts with 3 girls, each with a different background meeting each other as they begin their college life. There is a detailed description of the college and college life. The author then moves on and weaves in a political angle into the story. The infamous Mumbai blasts also forms a part of the plot. Then there is a love angle as well. The blurb of the books says about it. I would say, that the author tried to incorporate too many things into the story and as a result, she lost the grip on the story. The book failed to arouse any interest in me. 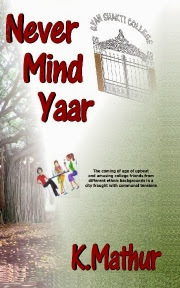 I didn't find any relevance of the title 'Never Mind Yaar' with the story in the novel. I would say: stay away from the book. Mathur showcases her unique perspective into her city’s psyche in Never Mind Yaar.